Victorian Elegance comes alive for you nestled in the bluffs of Historic Dubuque. The Hancock House, listed on the National Register of Historic Places, shows Queen Ann architecture at it’s finest. 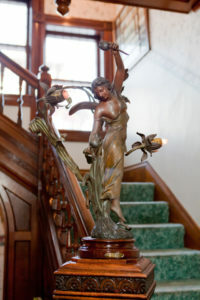 Built in 1891 by Charles T. Hancock. The third son of John T. Hancock, Charles succeeded his father as head of the Midwest’s largest wholesale grocer and distributor, the profitable JOHN T. HANCOCK & SONS. A business leader in his community, Charles was active socially as a member of the board of trustees in the local Methodist Church and succeeded his father on the board of Dubuque’s beautiful Linwood Cemetery. He was later active in racing at Nutwood Park and he was elected chairperson for the Iowa Republican Central Committee in 1898. Today Charles is best known for this beautiful home still bearing his name. 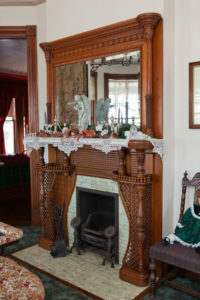 Within you will find several antiques which were in his own possession over one hundred years ago, including the award winning fireplace and a bicycle bearing the name of the company he owned and operated. Some gifts and mementos are displayed in an antique humidor once used for retail tobacco sales by Hancock & Sons company. Take your time and browse around the house enjoying the antiques, your host will gladly take the time to answer any questions you might have.